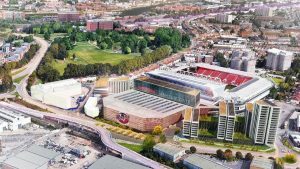 Ashton Gate Limited and Bristol Sport (the Club) propose to develop two sites. The Club’s vision is impressive. In principle, the Society supports the proposals. The image above shows phase 1 that develops the land between the Ashton Gate Stadium west stand and Winterstoke Road. At the centre of the image is a large new building which would combine a multi-modal Sports Centre, with a multi-storey car park. The Sports Centre would be home to Bristol Fliers Basketball and ladies netball teams and host conventions and exhibitions. To the north of the new Sports Centre would be two new hotels (one three the other 4 star), needed to serve the Stadium. The Sports Centre in front of Ashton Gate football stadium. Aspirations include attracting residential conference business. New homes would stand to the south of the new Sports Centre. The scheme will invest money in south Bristol and increase local employment opportunities for young people with modest educational attainment. The Club proposes to landscape Colliter’s Brook to make a park running through the Stadium. The Society supports the introduction of new homes on the site. The Society has said that it would not support tall residential towers beside the Winterstoke Road which the Club’s publicity illustrates. The Society suggests that there is enough space to the south of the Sports Centre to create an interesting high-density-scheme that is subservient to the Stadium. Phase 2 of the proposal is a new residential development shown to the right of the top image. Its boundaries are the Metrobus M2 route, Ashton Vale road industrial estates and the Long Ashton Park and Ride car park. This land north is part of Bristol’s Green Belt. On the assumption that the Council adopts the Local Plan Review (LPR) and releases the site from the Green Belt, the Society supports residential development. We were encouraged by the Club’s proposal to invest in the enhancement of the neighbouring Ashton Vale town green (far right of the image) to maximise the green infrastructure and mitigate the impact of development. We welcome the Council’s proposal in the LPR to designate this land a Specially Protected Local Green Space to maintain its undeveloped status and prominence in the landscape for community use. We support the Club’s intention to choose a developer who could produce a design for a ‘bespoke village’. I’m very concerned that the Hotel heights are under represented in the drawings(angle of view). The stadium itself visually dominates the East-West view . Where Ashton Court/ the Iconic Bridge play are distracted from totally. The Hotels are planned to be significantly taller. The football club rightly has a central role in Bristol. But I am concerned that this is another development of high rise Bristol. In regard to the height of the buildings, the hotels are described as being north of the proposed new arena, and do not look tall. The buildings to the south of the proposed arena are 3 blocks of flats, the highest being about 12-15 storeys, which is no higher than the much older blocks on the other side of the stadium. I am not clear which views if any of either Ashton Court or the Suspension Bridge are particularly affected by any of these proposed new buildings, considering that the stadium right next door is much larger. The more interesting thought is what this does for the Mayor’s plans for Temple Island, as having 2 conference centres in Bristol makes little sense, and this seems a better and larger option, especially with the stadium connection.